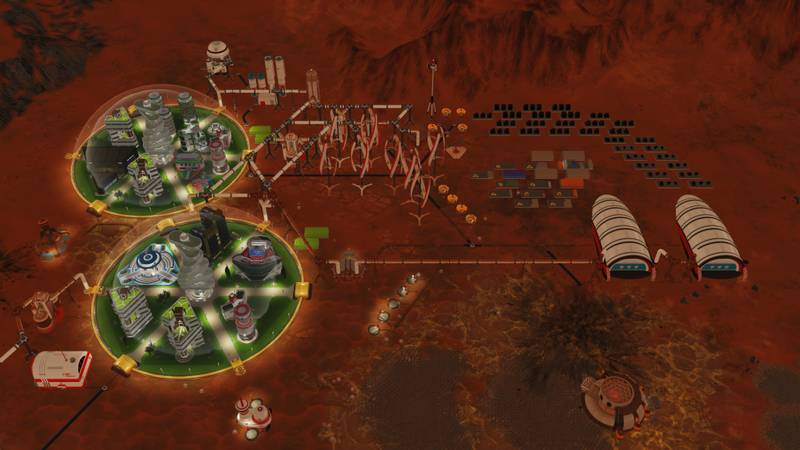 Surviving Mars is the latest release from Bulgarian developer Haemimont Games, best known for their work on city development and sim games such as including the long-running Tropico series. Their newest project invites players to develop and maintain a colony of human beings from Earth, on the barren Red Planet. As a space building simulator, the game delivers exceptionally and provides an in-depth and entertaining experience of what one might expect if they were to attempt to colonize Mars. 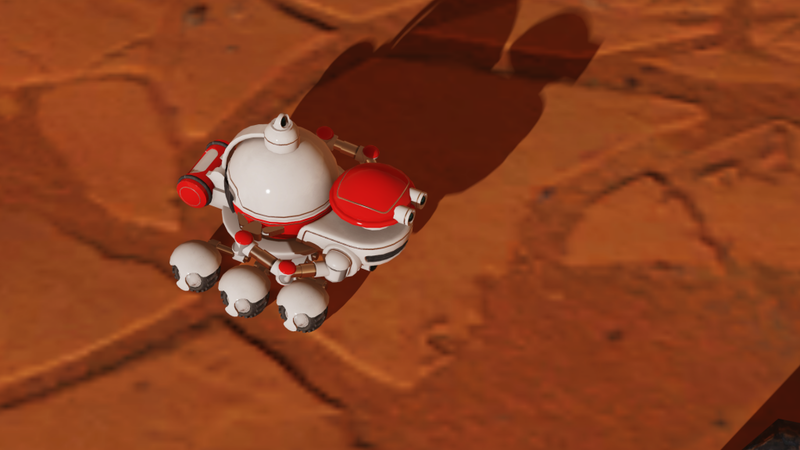 Surviving Mars is a beautiful game, with absolutely gorgeous graphics, even when you are zoomed ALL the way in to a drone. It’s not just pretty looks though; the game play is well-organized and fun, and the voice acting is quite well done. Loading up the game sends you to a decently laid out User Interface (UI), which is one of the most important aspects of any simulator or development game. The buttons are labeled instead of just being images, so you know exactly what you’re looking at/selecting. A couple of things stand out for me on the main menu, you have the options to manage mods and also a mod editor. For my review of the game I opted to play without any modifications. Selecting ‘New Game’ brings up several options, think of these like your challenge settings, they range from easy to very hard. The first option is the “Mission Sponsor” this option changes your starting money, base research per turn, starting applicants (settlers desiring to come to Mars). This also changes some more advanced things such as a bonus technology and how much additional rockets cost. The next option is “Commander Profile” which has less changes than your “sponsor”, giving only 2 unique bonuses. Following that, you design your logo, which has no effect on game play but will be your image for your new colony. Finally, you get to “Mystery” which is more or less your end goal. They have some fun and interesting definitions on them: Power of Three – “Science is no more than an investigation of a miracle we can never explain, and art is an interpretation of that miracle,” which is a Ray Bradbury quote. Or another option is The Last War – “Mankind must put an end to war before war puts an end to mankind,” by John F. Kennedy. As you can see they don’t specifically tell you what the advanced goal you are after is; those are revealed as you play through the game. Some examples include unlocking certain amount of research goals or having a certain number of residents by a certain time. The last menu gives you options to load your first resource shuttle. You are free to change what you are taking with you to the Red Planet, but keep in mind that this is a balancing act. The game starts off by dropping you on the Martian landscape with the resources that you selected at the menu you also select the specific landing site. It’s important to note that you cannot expand beyond the original landing site; you do have plenty of space to build at these sites, but it’s a little interesting that you cannot move to other sites throughout the map, so you need to be sure before you set up your colony. I have found throughout my playthroughs that there are two different issues I would like to see addressed: selecting multiple objects, and the overall pace of the game. You can only select one of any unit at any given time, which is all fine and dandy until you want to move your basic builders, called drones, from one location to another. I moved 18 drones, and had to click each one individually then move to the new location, click the new location, then go back and select the new drone. Doesn’t make the game unplayable by any means, but it can be a little frustrating when you’re trying to undergo a large-scale change like I was. The pace of the game on default is agonizingly slow for my own personal tastes. Building just a basic wind power plant takes almost 10 minutes, gathering enough resources to build said power plant takes another 10. If you are the patient type, this might be great for you; for me it was not. There are three speed options, but I found myself only playing the game on the fastest setting. Everything else was way too slow for me, to the point where sometimes even the fastest setting could have been sped up a little. The graphics are very pretty; zooming all the way into a drone you can see how they are constructed, what they are carrying, and even the funny looking eyes they have. This is the type of detail that is not often seen in building sim games, which often lose detail the more you zoom towards street-level. Players of the Tropico series will know that Haemimont Games is not one to shirk on detail at even the most minuscule level. Meteor showers are fun to watch as long as they aren’t landing on your buildings and destroying your hard work. The game is not very difficult to learn, controls are fairly simple and feel appropriate for the title. Gameplay is relatively simple, while still presenting the type of challenge you want from a game that has you colonizing Mars. At the core it is a resource management and city-building game. 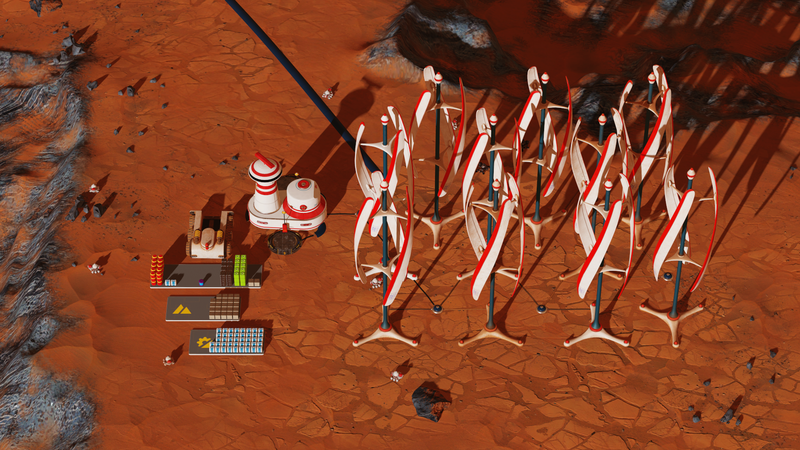 You have multiple resources to manage and balance, but the most important ones for your settlers to survive are food, oxygen, power, and water. The other resources (Concrete, Metal, Polymers, Machine Parts) are used in construction and maintenance of buildings, and Precious Metals are transported back to earth and sold. The final material, Fuel, is used to either fuel return trips to earth or to use for advanced buildings, and becomes increasingly more important the further you make it into your colonizing efforts. The resources are mostly balanced fairly well; I found I was ordering a lot of machine parts to maintain my buildings, but I think mostly that was a lack of my own understanding of how to obtain them in the game otherwise. Food is fairly abundant considering your conditions, and I only had starvation issues when I failed to move the food storage close enough to the living domes, which was more of a transportation issue. Overall, I found the game to be quite entertaining, and a welcome change from the recent influx of faster-paced multiplayer games. Surviving Mars for me was a wonderful game to play after a long day of work; just relax and drink my tea and prepare for bed by letting my mind wind down with the colonists. I had a lovely experience with this game, and I will continue to enjoy it when I want something a little more calm and relaxing than my usual fare. 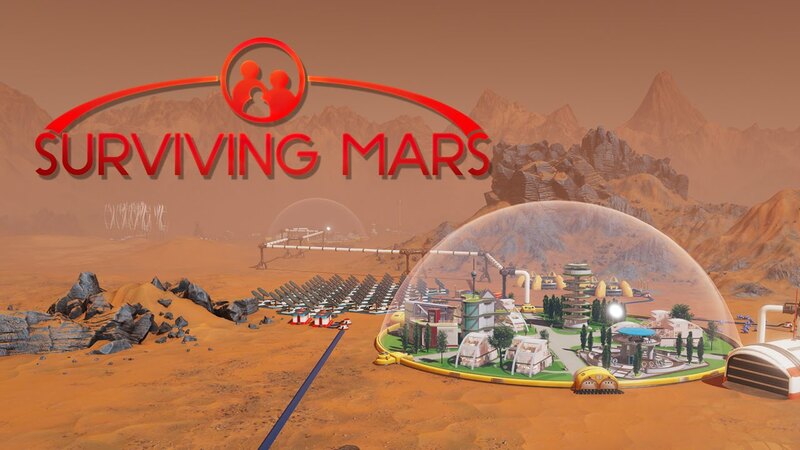 If you enjoy games like Civilization or Cities: Skylines, you too will likely enjoy Surviving Mars. While there is no combat like in Civilization, the combination of resource management and city building make it a very entertaining title. Haemimont Games and Paradox Interactive have shown that they are still masters of their craft even when they take it out of orbit, and I would recommend this game to anyone looking for a more far-out take on the genre. 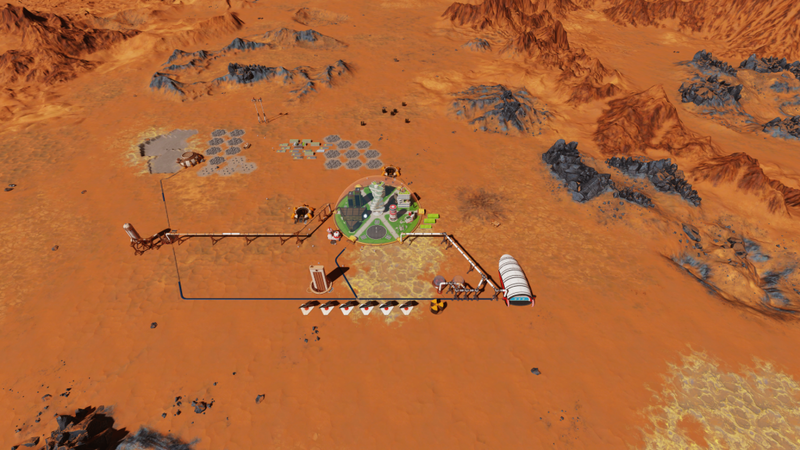 If you’re looking to take your city-planning out of orbit, Surviving Mars presents a great balance of sim gameplay. A digital copy of this game was provided by the publisher for review purposes.